Lynn Bremmer was born in British Columbia's Kootenays. She attended Douglas College and the BC Institute of Technology. Her career began at the BC government dairy lab in Burnaby analysising milk. When an opening occurred in the wine lab she applied and was hired. Lynn advanced to the position of Assistant winemaker and soon found herself working as the assistant winemaker at Andres Wines. 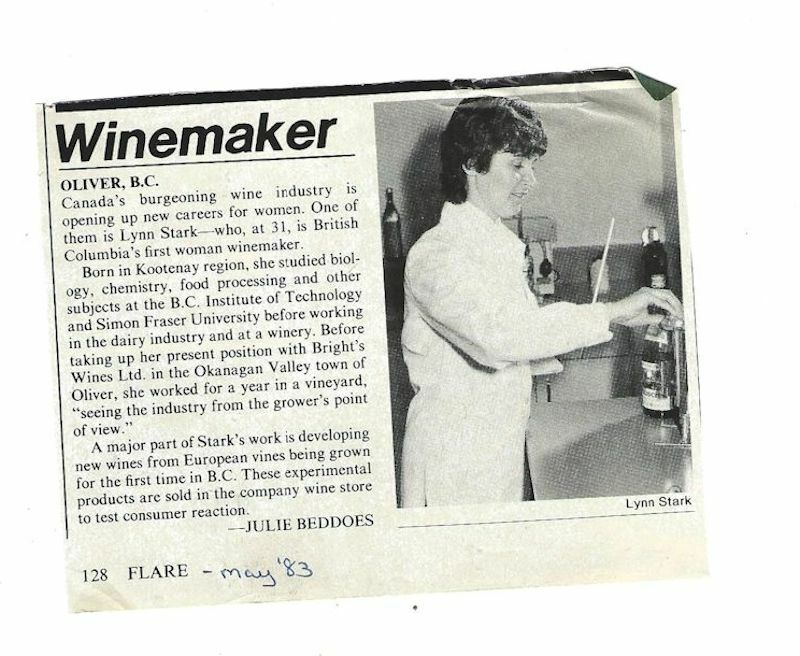 John was at Andres for 12 years (1966 to 1978), eventually becoming general manager; She started in 1973 and left in 1980 where She joined John on the Similkameen Vineyard which he had purchased with Bob Holt (former St.Michelle GM and eventual president of Sun Rype). 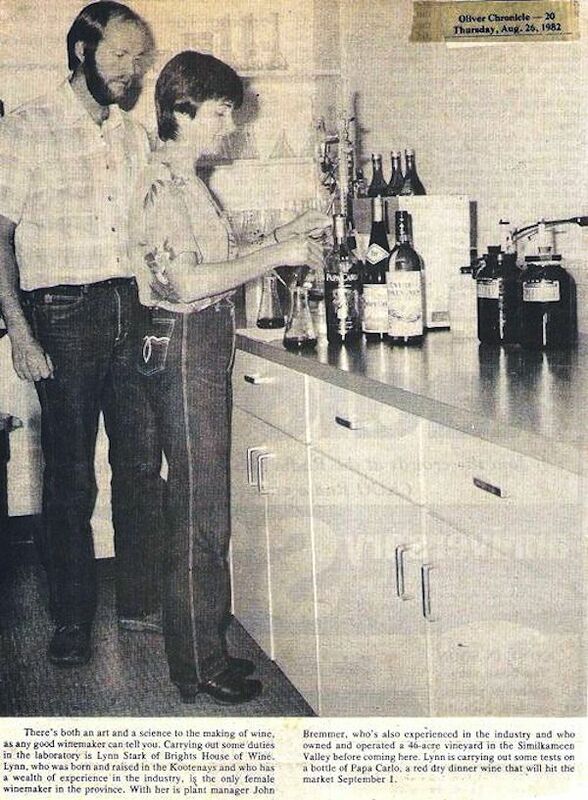 They sold their half of Similkameen vineyard to Bob Holt and moved to Oliver in 1980 to oversee the construction and hiring of people for the Brights Winery. 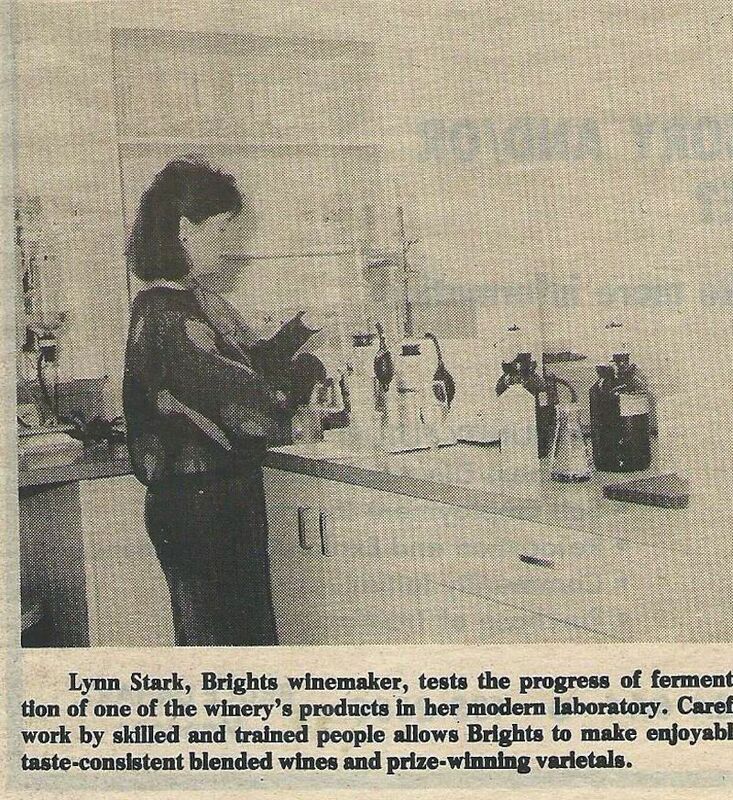 Once joining Brights Lynn went to University of California for advanced winemaking courses. She also visited the famous Geisnheim Institute in Germany. In 1985 they received two bronze medals for the 82 Baco Noir and Entre Lacs - white at the International Wine and Spirits Competition in England The BC Ministry of Agriculture gave Brights "award of excellence for their Chardonnay. By now Lynn had quite the reputation She helped establish Gray Monk Estate which open in 1982. Working on an ambitious project for Brights (and now consulting to many B.C. growers and wineries with partner John Bremmer), Lynn made minuscule amounts of Mtsvane and other Russian varietals—Rkatsiteli and Oraniensteiner among others, all based on experimental plantings from the “Becker Plots”. The project only lasted about three years—from 1983 to about 1986—and only Oraniensteiner seems to have any sort of presence in the Okanagan now. (The Martiniuk family’s Stoneboat winery makes a luscious sweet wine from the grape, called Verglas. 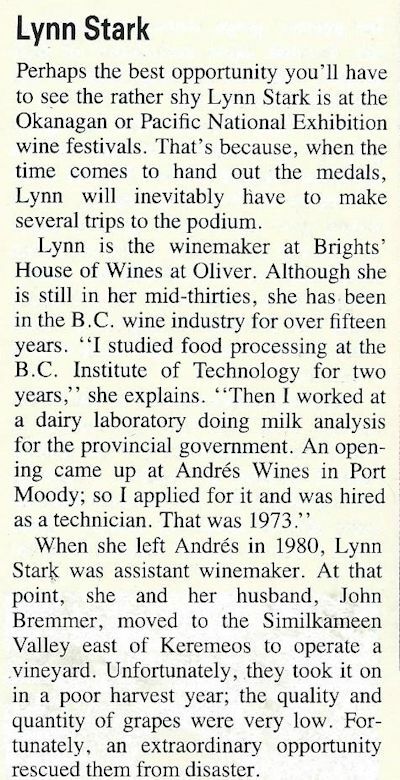 After 12 years, leaving Brights, Lynn has remained active in the BC wine Industry. Presently Lynn sits as chair of the BC Wine Grape Council and also chair the Lab Proficiency Testing (LPT) committee. Lynn started the LPT testing about 10 years ago and for the last 5 years have worked in conjunction with Dr. Kevin Usher to compile results and statistics and help wine labs improve their procedures and techniques. They have also convinced the BC Wine Authority that the LPT testing is an important part of wine lab certification and it is now mandatory for all labs registered with them and doing VQA analysis. Lynn and John Bremmer have been doing B.C. Wine Grape Acreage Report, along with some help from staff and members of the B.C. Grape Growers’ Association and John Schreiner. Today John and Lynn operate Mount Kobau Wine Service in Oliver. They have consulted with Gray Monk, Cedar Creek (when it was known as Uniacke), Andrew Peller, Vincor, Mission Hill, Burrowing Owl, Maverick wines, Hester Creek, Red Rooster, Domaine de Chaberton, etc. They do VQA analysis and grape maturity testing for many different wineries.